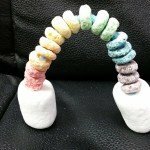 This standing rainbow project is great for young and elementary school students. It’s a great project to work on color sorting, counting and motor skills. Follow the step-by-step directions below to make your own rainbow. Step 1: Cut the tips off each end of the pipe cleaners. This will shorten the pipe cleaner enough so the project can stand up on its own. 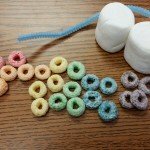 Step 2: Give each child 3 fruit loops in each color: red, orange, yellow, green and purple, 1 pipe cleaner and two jumbo marshmallows. Step 3: Have the children stick one end of the pipe cleaner all the way into one marshmallow. The pipe cleaner will need to be half way through the marshmallow. Step 4: Have the children add each color one at a time on the pipe cleaner. 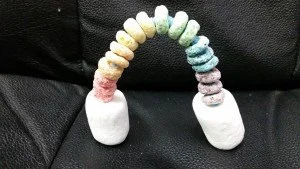 When they are finished have them stick the end of the pipe cleaner into the remaining marshmallow.